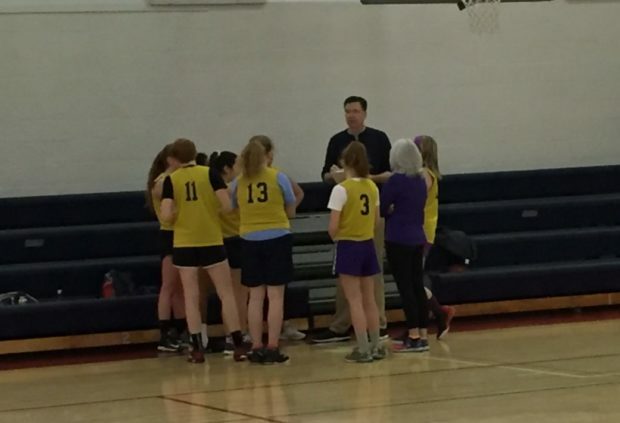 Former FBI director James Comey might spend his days subtweeting President Donald Trump, cavorting with his “Deep State” allies and polishing copy for his new book, but he still manages to set aside time to coach a girls basketball team. I recently caught a family friend’s basketball game at a public high school in Virginia, only to discover that none other than the man at the center of Trump’s biggest headache was also strategizing the potential downfall of my family friend’s team. I mean, the nerve of the man. Everyone is wondering what Comey’s been up to since his early departure from the FBI, and I found myself in the perfect position to snag some (admittedly low quality) photo and video of the khaki-clad Comey drawing up his best basketball plays (for future athletes 16 and under). Comey stands at 6’8″ and played basketball in high school, giving him the necessary chops to coach a young girls’ team. According to Comey’s friend Daniel Richman, Comey last dunked a basketball six years ago when he turned 50. He didn’t need to dunk for his girls though, who won handily over my favored team by double digits.